If you’re using Windows Embedded Standard 7, AxProtector, IxProtector and AxProtector .NET are available to you. 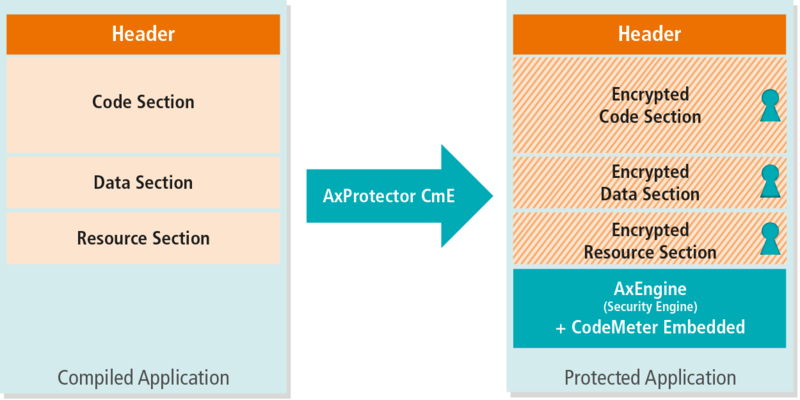 AxProtector and IxProtector can replace AxProtector CmE in a Linux environment. These variants require CodeMeter Runtime. The use of AxProtector CmE does not require any change to your source code. You just integrate AxProtector CmE as a post-build process. Encryption operations are carried out by AxProtector CmE after compilation of your software. AxProtector CmE is available as a command line tool and can be integrated into an automatic build system as part of continuous integration.